Horror, for me, lives in audio. The Man in Black or, as it used to be called, Fear on Four, has run on BBC Radio 4 for decades. The idea was, and is, simple; the Man in Black is the mysterious host of a short radio play, introducing it, setting the stage then coming back at the end for a dryly funny bookend to the unremitting horror. The most recent incarnation sees the mighty Mark Gatiss take the role. It’s wonderful stuff and it used to scare the living hell out of me when, aged 12 and upwards, I sat in bed and listened to it. That show is the reason I love audio horror, it’s the reason I work in audio horror and once you listen to it you may notice a couple of beats that I borrow from time to time over at Pseudopod. It’s also one of the reasons I’m delighted to be part of Thirteen. 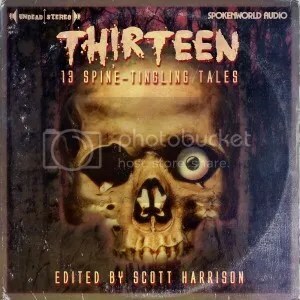 Edited by two fisted genius Scott Harrison, it’s an audio anthology designed to mimic the old audio horror anthologies of the 1970s which did for Scott what The Man in Black did for me. That by itself would have my attention, but Scott’s not stopped there. First off, it’s produced by Neil Gardner. If you’ve listened to any audiobook in the last 5-10 years and enjoyed it there’s a very good chance Neil produced it. He’s one of the best in the world in his field, as well as being a phenomenally nice guy and he’s on top form here. On the authorial side alone you have some of the best voices in UK horror contributing work. Dan Abnett, Stepehn Gallagher, Kim Newman and Simon Clark are huge influences on my work, both non-fiction and fiction and authors like Kaaron Warren, Gary McMahon, Cavan Scott, Johnny Mains and Scott himself are some of the very best voices working in the field today. Then there’s the voice cast. Some of the most talented, most recognizable actors and actress in the UK worked on this thing and they all knock it out of the park. These are people you’ve seen, or heard, before and that sense of familiarity, combined with the horror of the stories, creates a delicious sense of unease. Arthur Darvill, who made his name playing the single most decent man ever to travel in the TARDIS is on here. Michael Maloney, whose Hamlet is one of the best I’ve seen is on here. Frances Barber, Samuel West, Gemma Arterton, Jeff Harding, time and time again you’ll hear familiar voices on this album and each one of them is telling you the most wonderful, horrible things. That’s me.Sitting in between Stephen Gallagher and Kim Newman which is the single most thematically appropriate running order I’ve ever been on. And that’s Lalla Ward, best known for playing Romana II in Doctor Who, reading words I wrote, using my hands and my brain and everything. The story itself has a very odd genesis, and changed a lot between the original draft and this version. I’ll talk about that in a separate blog post. I remain very proud of it though which is both rare and an immense relief. It’s a nasty, focused little story and I can’t imagine it in any other voice, or any better company, than it is. I’m deeply grateful to Scott and Neil for doing such an incredible job on the disc, to the mighty Matt Dillon for the extraordinarily good cover art and to Lalla Ward for doing an incredible job on the reading. Thirteen is available now, the link is below. If this is a success, there’s a strong chance it’ll become a series of albums, giving even more writers and voice artists a chance to scare you in the very best way. If you like audio horror, if you’re a Pseudopod listener, a Doctor Who fan or just devour audiobooks like they’re made of chocolate, believe me, this is for you. Thirteen is so good, it really is scary.